As 2008 comes to an end, I would like to share with you some of the highlights of the past six months at the Handicraft Center in Shangri La. To begin, I am pleased to note that we have completed more than two years in our Shangri La location, the Handicraft Center sponsored by Pansy Ho and the Hong Kong Federation of Women. This has only been possible with support and encouragement of all of you, and with the help of our very talented staff, volunteers, friends, neighbors, and partners. I am very happy to introduce Wang Man, or Jenny, as she is known to us. She came to Shangri La as a volunteer in August and joined our family as a staff member in September as YMHF Shangri La Program Director. She has guided several generations of volunteers through our summer-fall-and now winter projects. She has learned a lot about bees and honey, managing handicraft projects, library development and so many other things. Visit our Handicraft Center and you can have an introduction to traditional lifestyle and YMHF projects with Jenny herself! 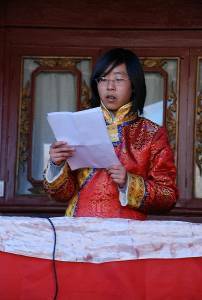 Meet Tacuo, our shop assistant and resource link to local Tibetan culture and lore. Tacuo managed the craft table in the old town market square this summer. 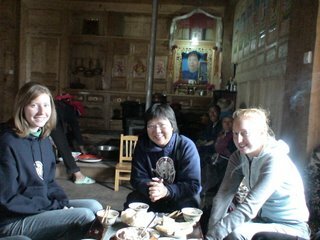 She has learned a lot about tourists and their interest in Shangri La regional culture and crafts. She is studying English to take on more responsibility in the store and center in the future. For those of you who have spent time at the Center, you will know Duan Ayi well. She is the multi-talented Ayi who doubles as sales rep, butter tea demo expert, adviser on craft procurement and lately our honey liaison person. She has been with us from the beginning, when the Center was just an idea nearly three years ago. 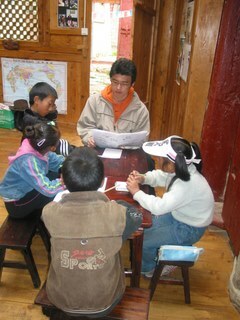 The volunteers teach English to students and community members, free of charge. You can drop in any afternoon to meet our students. Some of our visitors have enjoyed impromptu activities with the students. During the summer, Julia coordinated the volunteer staff to accommodate 60 enthusiastic students. 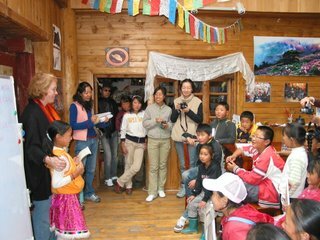 We were delighted to send English teachers to Eastern Tibetan Language Institute for the vocational training in the 2008-2009 Youth Pre-Employment Training Program (YPET). This project targeted training for one of the more vulnerable sectors: young village women. 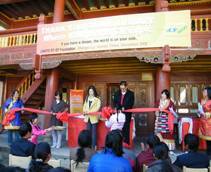 December 16, 2008 marked the opening of the 2500 volume library in the Shangri La Handicraft Center. The library books and furnishings were sponsored by a generous donation from the ST-EP Foundation. Mr. Shi DingXiong, Vice director of Bureau of Foreign Trade and Economy, welcomed all the guests. On behalf of the people of Shangri La, he thanked Ms. Han from Seoul, Korea (Acting Director-General of the ST-EP Foundation) and Ms. Shin (donor and student at Princeton University). Jenny read Ms. Malik’s words of thanks. Members of the Gylathang Children’s Home performed local Shangri La traditional songs and dances. 30 VIP guests attended the opening to celebrate this wonderful occasion. 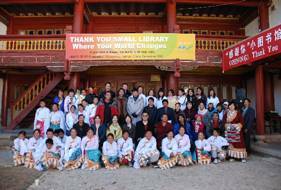 The project known as “Thank You Small Library” is now open for reading and lending to our Shangri La student community. There are books in Chinese and English languages. In a nutshell: We are developing our capacity as a Learning Center. YMHF continues to focus on income generation through Handicrafts. We set up a craft table in the square this past summer to help bring local, traditional crafts to tourist attention. Out team participated in several holiday sales in Beijing to promote the “Shangri la brand” craft. We hold Yak butter tea and weaving demonstrations in our center for tourists. We are working on micro enterprise projects. This past year, we have tried our hand in bee keeping, honey processing and producing rushan cheese from yak milk. 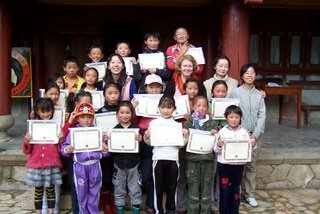 Our volunteers have researched local folk medicine and local Khampa dialect for a handy lexicon. We have hosted international student groups and presented an afternoon’s introduction to art, lifestyle and architecture. Alia and I, along with a great team of volunteers, sold Shangri-La Botanical Soaps and handicrafts to our friends at the annual Hilton Hotel Rotary Club fair, Embassy House Bazaar, Bazaar at Western Academy., and the Diplomat Spouse Book Club annual holiday lunch. All profits from the soap and crafts sales were handed over to YMHF for its spring projects. Thanks to Darlene, Sophie, He Lin, Celine, Albert, Rachel, Zhang Wei for your help. Build on our support and promotion of local artisans and handicrafts through our Shangri la outlet. Begin to develop a web based market. Build on our partnerships with other producers and entrepreneurs. Expand our village based beekeeping initiative. We love to meet new partners and bring friends to Shangri La to experience first hand the magic of this lovely place. So come and visit. Join our volunteers. Continue sending us your thoughts and inspirations; so many of our projects have come from your valuable insights. Your generous donations and sponsorships have kept us going. Thank you for your interest and endorsement!